Summer is right around the corner, and whether you have your sights set on the infamous Coachella festival or simply watching a band play on the local patio, it’s time to grab your cut-offs and embrace your inner Vanessa Hudgens because for this season fringe is the new black. In preparation for the warmer weather, Guess celebrated their new Festival Capsule Collection last night with an in-store event. Live models showed off some of the collection’s most standout pieces while stylists from Blo helped guests get into the festival mindset with a braid bar. With inspiration coming from music festival style, you’ll be sure to see tons of bright neon, denim cut-offs and lots fringe this summer. A total plus to this edgy festival style is that everything is just so comfortable. All the denim is distressed and worn-in, and tops should sit a bit looser than normal. Rachelle Saevil and Michelle Bilodeau from frontrowmag.com feel the same way. “I think a fringe vest is fine to wear with cut-off army print shorts, a floral headband and some spikey bracelets,” explains Rachelle. Rachelle, Michelle and Grace all agree that a fringe bag or a pair of printed denim shorts can add a festival flare to anyone’s summer wardrobe. What I learned over the course of the night was as long as you feel comfortable in your outfit—and you steer clear of fringe pants—you’ll look great in whatever combination you come up with this season. 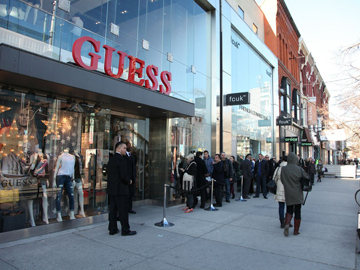 Guess put on a live fashion presentation towards the end of the night, facilitated by Flare Magazine. I caught up with marketing editor Erin O’Brien to see what the modern twist is to this retro festival style. Along with fringe bags, Erin and Grace chose Guess’ long-sleeve white lace blouse as the must-have item this summer. It will run you $79, but it can serve as a layering piece under thin sweaters, an easy, breezy bathing suit cover-up or as a great stand alone piece when worn over a killer crop-top. Photos courtesy of Lotus Leaf Communications, Inc.